This is my first post on TypeDrawers. I'm a graphic designer, college lecturer and sometime type designer. 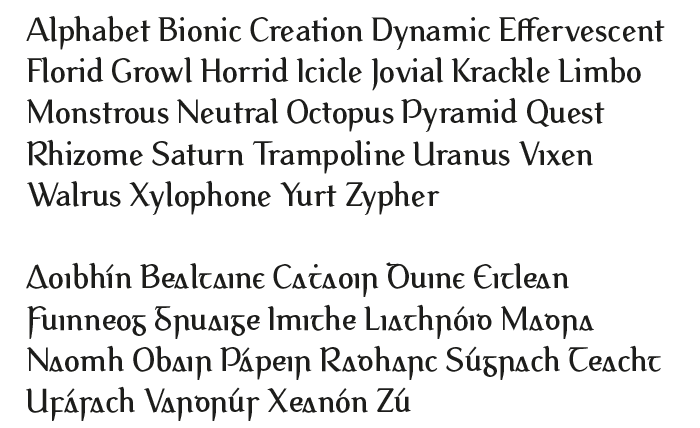 I haven't released any fonts previously as I've never been entirely satisfied with them, but I'm determined to see this one through to completion. Please be critical! Bunbeg is a serif inspired by an old hand-painted sign written in old (~1850s) Irish. I created the Irish letter forms first, then went on to add the Latin. I'm using Glyphs with three masters — light, semi-bold and Heavy. I've attached Regular here. It's partially kerned (mainly lowercase) and there's no italics yet. The proof sheet shows the Latin mainly, but I've also included a few pages in the Irish. The acute seems detached from the base glyph. It needs to be either lowered or made more inclined and longer. (I feel similar about the dot accent, that's a tough one, though, as it looks fine above the /i but not above the /t – you might need to find a compromise). The /f and its ligatures need more spacing work. Not sure how you'd go about making the italics? An interesting approach to take the Irish set as a starting point. But to execute all this to a satisfactory level – will be hard work. You have a promising begin with the lowercase. 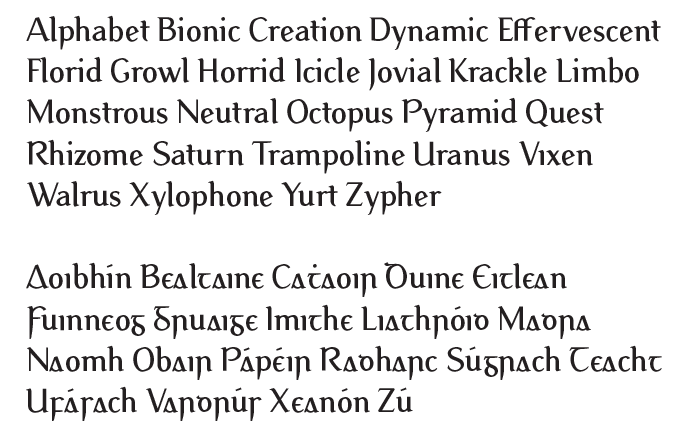 Most of the uppercase, on the other hand, seem unorganic to me. Rethink your treatment of Irish/Latin P/R and B. The teminals of S and Z – leave me without a clue about what you want. Why not doing the typical closed Irish e with rightward middle-stroke? The accents sit too high, the acute is too flat. Thanks for your comments, guys. It's great to get a fresh set of eyes on this. The acutes (and grave) were longer previously — a last minute tweak to accommodate the heavy version has upset the others. I'll rectify that. I've been using the Cap height as the top marker for the diacritics — do you think I should go lower? Andreas: I agree with you about the P, R and B, the P in particular. I'll repost in a few days with alterations to P,B,R,/t and the acutes. S and Z will come later. It'll probably take longer to deal effectively with the general spacing. By the way, Andron is beautiful! Mike: Thanks for the Dermot McGuinne reference. I'll look into it. I've been using old books and papers (An Cliadheamh Soluis, Fenian Poems by John Daly etc as references). Further to your comments above, I've made a few changes. The /t has lost it's taper, I may exaggerate the lower curve further. 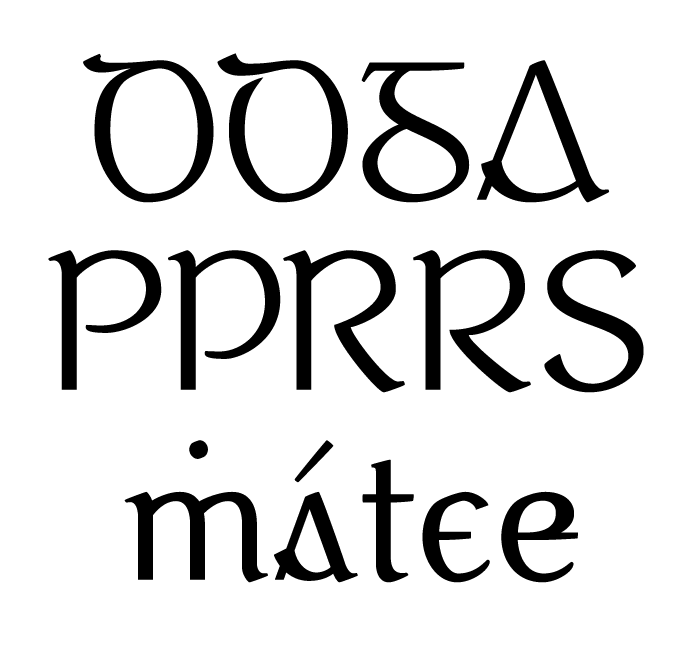 The P, B and R have been adapted (see the Irish version). 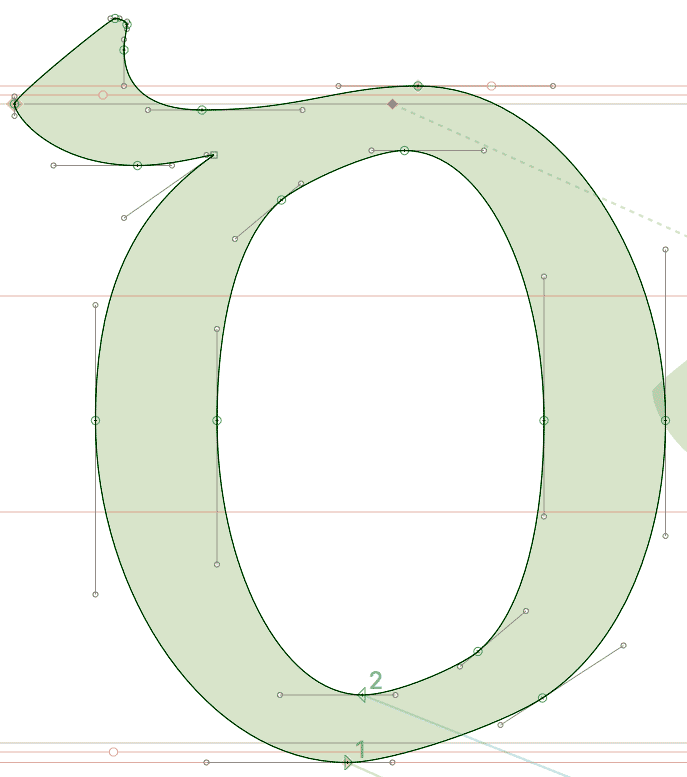 I've also widened the G, E and F. At Andreas suggestion I've included an /e with loop and extended stroke. I've also changed the accents, the sharper angle is a definite improvement. The Irish hasn't been properly spaced or kerned yet, so it's really just letter shapes I'm trying to pin down at this point. On a separate note, some of the glyphs seem higher than others — not note the /d in Radharc above — it actually descends the same amount below the baseline as any other curved letter, see below. The sample was created in Illustrator, saved as a pdf then converted in Photoshop. It doesn't seem apparent in either InDesign or Illustrator. Perhaps it's a conversion issue. hi Matt, it could be a hinting issue, missing a zone or something like that. 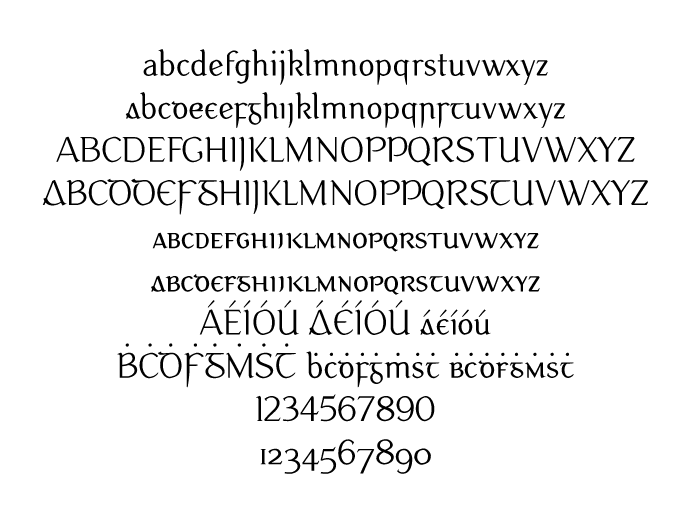 you could try generate the font without hinting. Thanks, Mike. I think that was the issue, I had auto-hinting turned on. I've made a few alterations based on the comments above. The acutes/graves have been changed (possibly too light at the moment - need to balance them with dotaccents and other diacritics). Some of the Caps have been altered/widened (GPR). I'm also taking a closer look at how I'm handling the serifs and terminals based on Andreas' comments. The examples below are Bunbeg Light. The regular is interpolated so I think it's best to provide a master as an example. And some more detail. I'm experimenting with expanding the strokes a little (eg A), opening some of the letters (D). With P and R, the older version is first, the newer second. I'm not sure about the /e — I think it still needs to shed some weight on the right. I appreciate all the comments and criticisms you make — the harsher the better! Could you provide a pdf to see details? Here you go, Mike. It's a pdf of the alphabet collection posted earlier, with a few tweaks. I think the opened D is an improvement, so I've opened the G too (just uppercase at the moment. Thanks for taking the time to look at this. McGuinne's book just arrived — thanks for the tip.